Web-based searching allow you to search your way; by name, by address or by phone. View multiple results of telephone listings. Our interface indicates if an address in a telephone listing can be standardized and used for mailing; often what appears to be a complete address in a telephone listing is not. For premium-enabled accounts, "Optimized Addressing" will often find a complete address with secondary (apartment, suite, etc.) 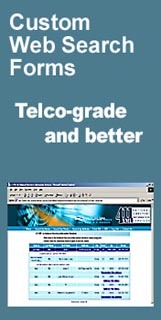 address from other non-telco high-quality sources automatically. In addition (for certain clients and business uses) we can find listings that do not appear or are marked "unpublished" in telephone databases. Rates vary per successful query depending on your business requirements for multiple sources and monthly volume. No results, no charge! Subscription accounts begin at $70 per month. Our web subscribers can also perform unlimited USPS address standardization and usage/carrier-only queries at no charge. Batch services are available with no minimums for monthly subscribers; as-needed batch services are also available to non-subscribers (minimums apply). Please contact us for details. Sign up for FREE TRIAL using our automated email/IVR activation system.